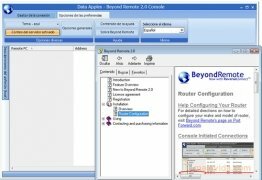 Beyond Remote is a tool that can be used in those cases where you require to offer remote technical assistance or to access your home computer from the office, because it will offer you the possibility to take control of any computer connected to Internet or to a local network. The program provides a series of very interesting utilities by means of which you will be able to chat with the person that you are offering assistance to, exchange files or reboot/turn off the computer that you have under your control. This tool also offers security and customization functions depending on each connection that you carry out, in such a way that it will be possible to adjust the visualization size of the remote desktop, use graphic acceleration functions or chose between the six interface themes that are available. If you are looking for a professional solution to connect to any computer remotely, one of the best alternatives that you will have available is Beyond Remote. This application requires that you have a client for the program on the computer that you want to connect to. The trial period lasts for 30 days.